My husband and I were lucky to watch the Atlantis launch from the beach at Patrick AFB and then this morning it flew over our home in San Antonio on its approach to Lackland AFB. From your blog we knew we had a chance to see it and we drove out to Lackland to watch it refuel and take off. This was my second shuttle sighting in San Antonio. Thanks for the great pictures and blog. Awesome pic!! Glad it made it back safe. What an opportunity you’ve had! Thanks for sharing! You answered the question about flying in rain, but I’m still waiting to hear why a shuttle that can fly in the near-vacuum of low earth orbit can’t fly at an absolute pressure lower than psia while on the SCA. I’m thinking it has something to do with the lift needed to keep the 747/orbiter combo in the air, but I’d appreciate some clarification. Thanks again for all your updates and pictures – very exciting! Great blog. Have been following it from the start and I must say it must be an awesome feeling getting to see all of that equipment work and see the final product of a well thought out plan. Question: How were you chosen for the blog, is this your first or have you saw others? Thanks for the blog and keeping us informed about the journey home. It has been a treat to be able to see this in detail and understand at least some of what goes into such a complex mission. I can see now why NASA are so keen to get the shuttles back to KSC on re-entry! What a mission! Welcome back Atlantis, thanks to Dan for the blog, and the pilots for getting the shuttle back to KSC! 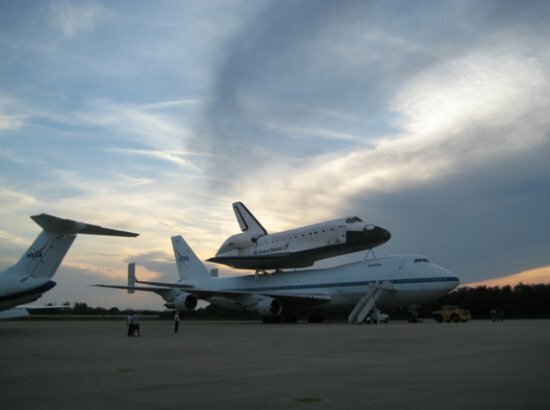 Thank you for such a detailed blog on how the shuttle made it back to Kennedy Space Center. It makes it feel like we were there kinda. again thanks. Dan, Thank you for your blog! I loved it! You are a lucky guy! to NASA for inviting you to go with them and allowing you to post blogs and pictures. Previous Previous post: Atlantis Leaving Mississippi — May Visit the Beach?